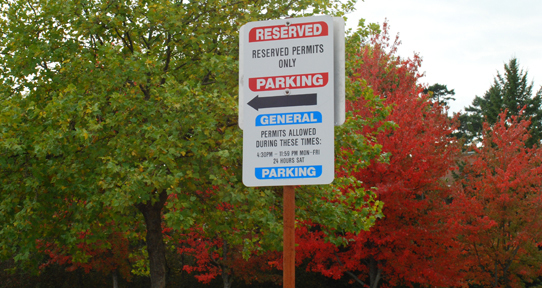 Look for these signs in parking lots, which indicate which spots are reserved for specific permits. Pay parking is in effect in main campus lots 24 hours/day from Monday to Saturday. There is no charge for parking on Sunday or Statutory Holidays. General Parking permits are valid in all numbered lots outside Ring Road. Reserved Parking permits are valid in all lettered lots and all numbered lots around campus. Please note the signage in all lots to ensure you are parking in an area that is valid with the permit you purchase. Areas marked reserved are for designated reserved permit holders only. All of the lettered parking lots inside of Ring Road are designated as Reserved and are not open for General use until after 4:30 p.m. weekdays and on Saturdays and Sundays. Permits may be purchased online or at the Campus Security Services office. When purchasing a permit or registering a vehicle for the first time, you are required to know your vehicle make, model, color and licence plate number. Payment is accepted by credit card, Interac, cash, cheque or (in the case of full-time University employees only), payroll deduction. Permits are not issued to accounts that have outstanding traffic/parking fines. Daily/Hourly/Weekly permits may be purchased at any of the automated coin/credit card operated dispensers located in every numbered parking lot outside of Ring Road as well as at the Ian Stewart Complex (formerly known at the Gordon Head Complex). These machines accept Canadian coins, as well as Visa and MasterCard. For locations of meters and parking ticket dispensers, see the UVic Parking Map.